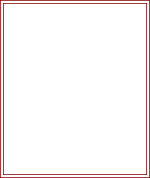 * to * to last 2tr, 1tr into each of last 2tr, ss to top of 3ch on beginning of row. Turn. Turn at the end of each row from now on. 1ch, ss to first dc. Turn. into next 1ch space, * rpt from * to * to end, ss to first dc. Turn. 1ch space, * rpt from * to * to last dc, 1dc into last dc. Turn. Fasten off. Join in contrast colour 1 and rpt Row 9 five more times. Turn. Fasten off. 15th Row - (Strap) Join in contrast colour 2, work 1ch, 1dc into base of 1ch, * make 1ch, miss 1dc, 1dc into next 1ch space, * rpt from * to * to last dc, 1dc into last dc, make 9ch, turn. # rpt from # to # to end, 1dc into last dc. Turn. 17th Row - (Buttonhole) Make 1ch, 1dc into base of 1ch, * make 1ch, miss 1dc, 1dc into next dc, * rpt from * to * to last dc, 1ch space and dc, work 3ch, miss 1dc, 1dc into 1ch space, 1dc into last dc. Turn. 18-19th Row - Rpt Row 9. Fasten off. Turn. rpt Pattern Row 9 five more times. Fasten off. Turn. 25-26th Row - Join in main colour and work Pattern Row 9 twice. Turn. Fasten off. Finishing - Sew in and tie off all loose ends of yarn, attach button to correspond with buttonhole. 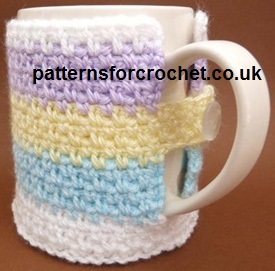 Hope you enjoy this free crochet pattern for mug cozy crochet pattern.